Nathan Mathis, a 74-year old peanut farmer from Alabama who recently found internet fame for protesting against former Senate candidate Roy Moore in honor of his daughter, visited The Ellen DeGeneres Show last week to discuss his late daughter and what drove him to protest. Nathan Matthis protest Roy Moore Monday night outside of a Moore rally in Midland City, Ala. ahead of the Tues., Dec. 12, 2017 special election. Mathis said his daughter Patti Sue was gay and come out to him as a senior in high school. She later committed suicide in 1995. Matthis claims at the time he was against her lifestyle choice, but has since become an advocate for gay rights. “I was once anti-gay myself. I said bad things to my daughter, which I regret,” he told NBC News as he protested Monday night. 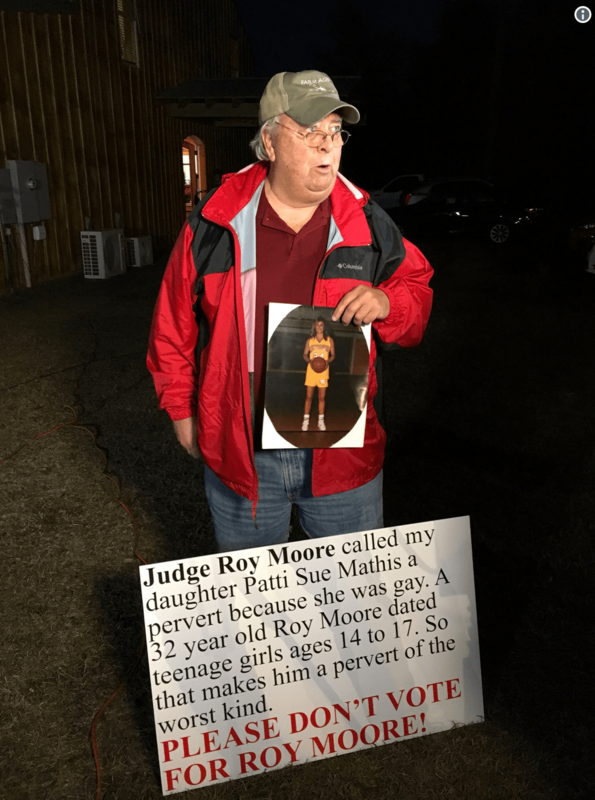 During Alabama’s recent U.S. Senate election between Republican Moore and his Democratic opponent Doug Jones, Mathis now famously held a sign claiming Moore called his child a “pervert” and denounced Moore’s stance against homosexuality. In an emotional interview on Friday’s episode of “Ellen,” Mathis explained he didn’t accept his daughter for being gay until doctors explained there was nothing wrong with her. “We took her to other doctors, psychiatrists, every one told my daughter, ’Patti, you can’t help the way you are. That’s what made me change,” Mathis told Ellen. In honor of Patti Sue, Ellen donated $25,000 courtesy of Shutterfly to “The Trevor Project,” a charity that provides crisis intervention and suicide prevention services to gay youth.